Have you any working parameter 37 examples? either to guide my issues, and/or for adding to selection menu. Had added those options and updated the plugin. 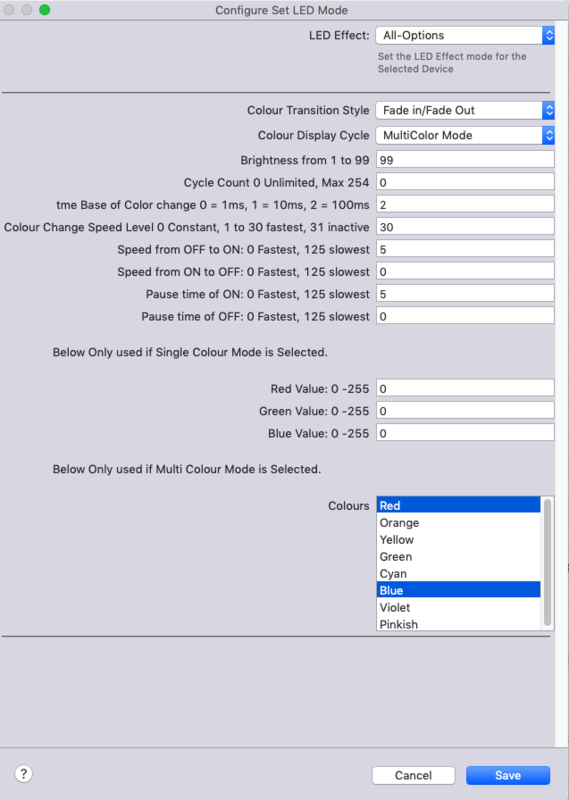 Still need a bit of testing for the colourChooser - not working completely right unfortunately (and side-tracked by Tesla plugin just posted)- need to work on my binary to decimal fangshey ..
Ok so I'm trying to get Patterns to work. sorry... posted this in the wrong forum..
Last edited by jltnol on Sat Jul 07, 2018 8:17 pm, edited 1 time in total. Back in the Plugin "Welcome to the LED Manager Pattern Editor", my Pattern is selectable and I can edit and save the colors and the times... but alas, I don't see a way to select the pattern as an Action Group. Not sure I can help and would suggest you post there? Now I just feel like an idiot..
Can you fix the images on the first thread of this plugin, and the pluginstore, and github? Can someone explain the interaction between raw Indigo use of Fibaro RGBW Controller or Aeotech RGB strips, this plugin and the LED Manager plugin? What do I need one or both plugins to achieve? I'm not sure I can go the full hog and explain how to use RGBW strips/controller. These modes - are set and basically cycle through colours/effects internally to look in this case like a fireplace. LED Manager - not sure - I don't use. Below is a red/blue quickly fade in, fade-out type siren effect from ZW121 LED strips. I am using the plug in on a ZW121 led strip with protocol version 4.34, app version 1.01.